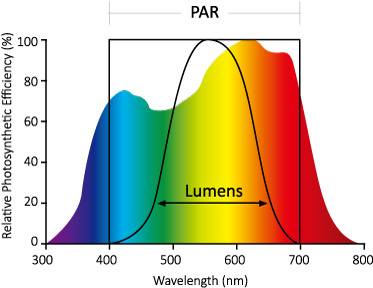 The portion of lighting spectrum used by plants – between 400 & 700 nanometers. This is different from the visible spectrum humans see. How many photons of light are emitted by a light source each second, or more simply, how much PAR the fixture produces. Measured as the total amount of PAR light that is emitted by a light source each second (μmol/s). The amount of light that reaches the plant. This is the It’s a measurement of the amount of PAR that is delivered (μmol/m2 /s). Since PPFD is a spot measurement and lighting intensity is greatest in the center then decreases towards the edge of a lights footprint, it’s important to take an average of a few measurements over the growing area at canopy height. The total amount of light that is delivered to a plant every day. Measured in mol/m2/d, this is the total amount of light (photons) that reach the canopy during the photoperiod (hrs lights are on each day). Measurement of how efficient a fixture is at turning electricity into usable light by a plant (μmol/J). To calculate this simply divide PPF by the total input power of the light fixture (lamp + ballast) - PPF/ input fixture wattage.